individual clients or account holders. Please note that we may amend this policy at any time, and will inform you of any changes to this policy as required by law. 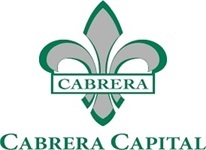 Cabrera Capital Markets, LLC. provides brokerage services by means of its own internal operation and those of its clearing firm(s) and other unaffiliated third party providers such as mutual funds and variable product sponsors. Cabrera Capital Markets, LLC. acts as an introducing broker to its clearing firm(s) which in turn processes transactions and acts as account custodian. All of the above referenced parties receive and maintain information about you that is related to and necessary for processing transactions in your account. To Non Affiliated-Third Party Providers- We do not provide personal information that we collect about you to non affiliated third party providers except that which will enable them to provide investment services to you. For example, we may provide information to mutual funds and variable product providers with whom we have dealer selling agreements in order to enable them to process transactions. Another example is that we must provide your personal information to our clearing firm(s) for purposes of securities trading, clearance, and statement preparation. Our agreements with our clearing firm(s) limit their use of your personal information to the specific purpose for which it was provided. Where required by Law or Regulation- We may be required to provide information about you with respect to a court order, a subpoena or a demand of a securities regulator. As authorized by you- You may direct us, in writing, to send account statements or other account information to a third party. HOW DO WE PROTECT THE SECURITY AND CONFIDENTIALITY OF PERSONAL INFORMATION THAT WE COLLECT ABOUT YOU? We maintain physical, electronic, and procedural security measures to restrict access to your personal information. WE CONTINUE TO EVALUATE OUR PRIVACY POLICIES. We continue to review and evaluate the privacy process in order that we may protect your personal information and keep all data accurate and up to date. If you identify any inaccuracy in your personal information, or if a significant change in circumstances dictates a change in your personal information, please contact us so that we may promptly update our records. If, at any time, in the future, it is necessary to disclose your personal information in a manner that is inconsistent with this policy, we will provide advance notice of the proposed change so that you will have an opportunity to opt out of such disclosure.